How to Change the mouse pointer as animated cursor with more effects? The people who are working with the computer daily have to follow this mouse pointer. This is a special bridge to set right the things in the system easily. Are you getting bored of the pointer which looks the same daily in the system. Are you planning to change the cursor using various effects? Then install CursorFX 2.01. Click on the Download Now option by entering the site and install the set up file. Then there appears the small window with My Cursors, Effects, Trails, Sounds, More Cursors, and Settings. By selecting the pointers in the My Cursors, which are of various kinds which are default in the windows. After selecting, the cursor there appears different kinds of animations on the upper side of the window. We can animate the desired effect by clicking on the selected animation. To change the pointer in an attractive way, select the effects option. In the same way click on the Sounds option to insert the sound effects. For the pointer settings, select the Settings option. 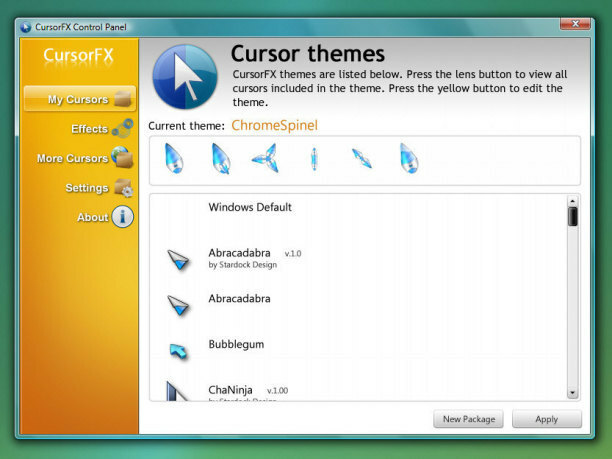 One can download various cursors by clicking on the More Cursors option in the site.